This glorious Georgian townhouse sitting proudly on coveted Chadwell Street in Clerkenwell was built by a tailor between 1820 and 1830. 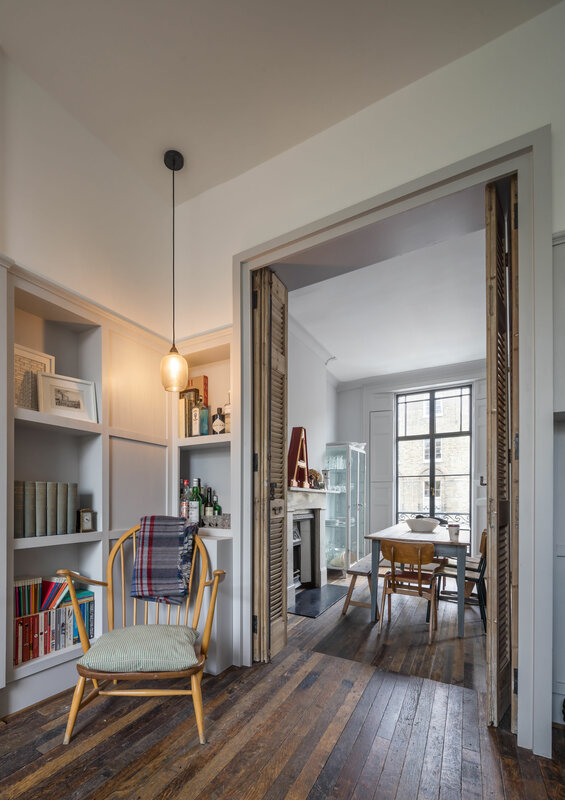 Our brief was to transform the first- and second-floor apartment, which had been cruelly neglected but boasted impressive proportions and wonderful character. 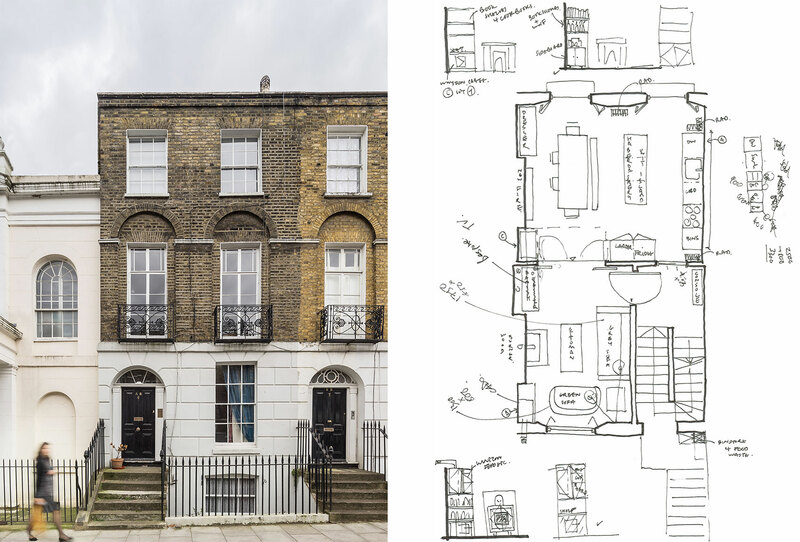 Although grade II listed, we obtained permission to reconfigure the entire plan for both floors; in fact this was the very heart of our design. 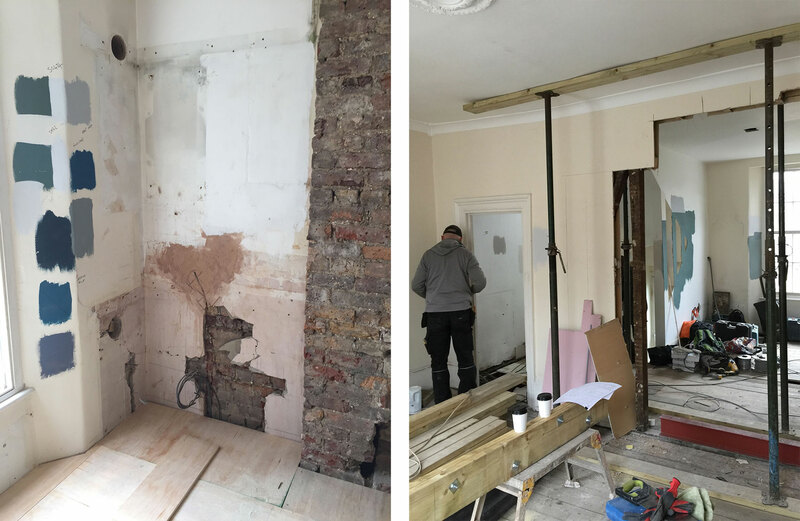 On the first floor we moved the kitchen to be the principal room at the front of the house and created a new opening into the rear room. This produced a dual-aspect living space making optimal use of the soaring floor-to-ceiling windows. 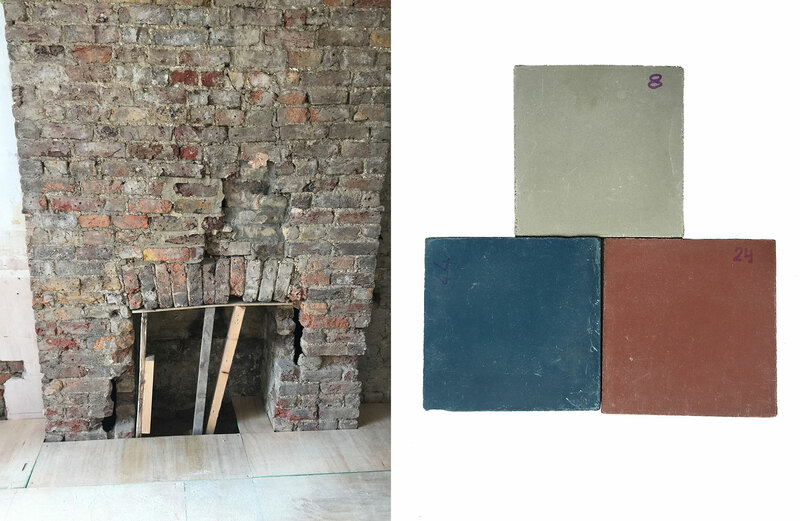 Peeling away the tired 1970s kitchen revealed a beautiful fireplace ripe for restoration. On the top floor we removed a dingy landlocked bathroom squeezed between two bedrooms without natural light or ventilation. Pushing it to the front of the property introduced lovely luminosity and allowed us to create two identical bedrooms behind. The tailor’s legacy was echoed in our fabric sketch for a new floor detail. 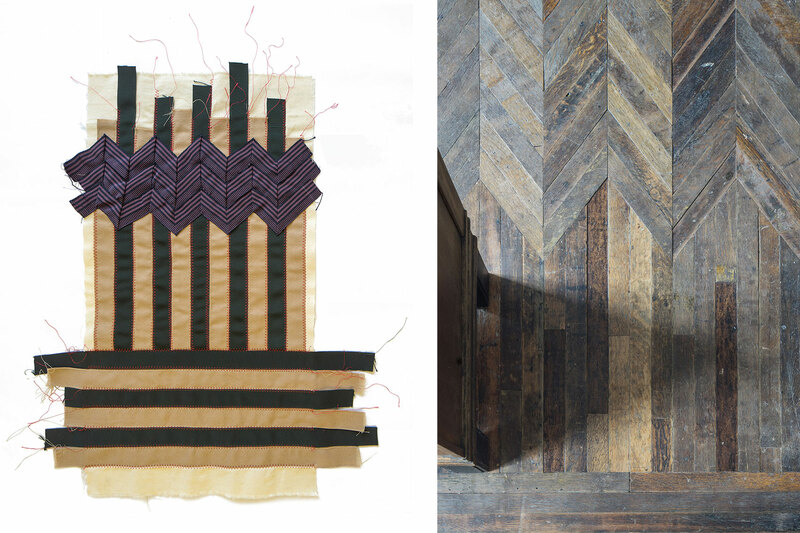 This detail – a herringbone pattern of floorboards – explored the transition from the kitchen to the dining space, and the design referenced the stitching shown on our sketch. Our love for reclaimed materials was allowed full flow in Chadwell Street. 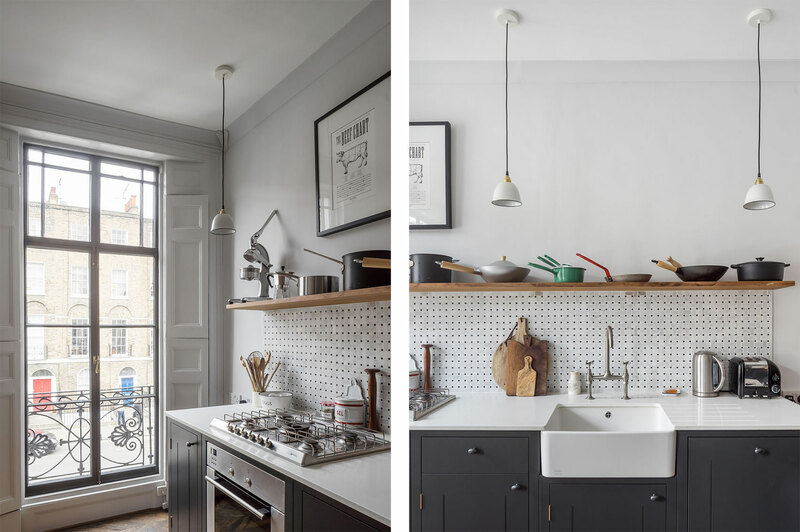 The floor was supplied by LASSCO (The London Architectural Salvage and Supply Co.). 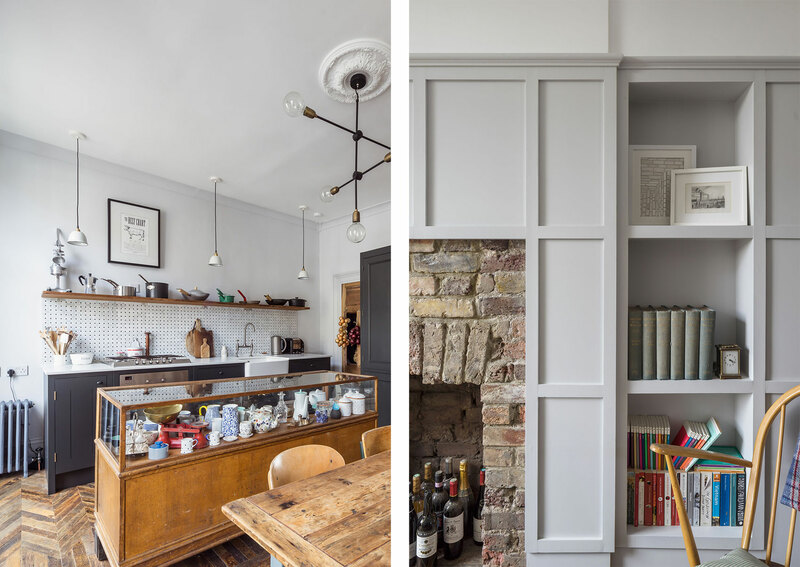 Having chosen a traditional handmade British Standard kitchen by Plain English, we complemented it with a ceramics-filled cabinet of curiosities giving it a new life as a kitchen island. 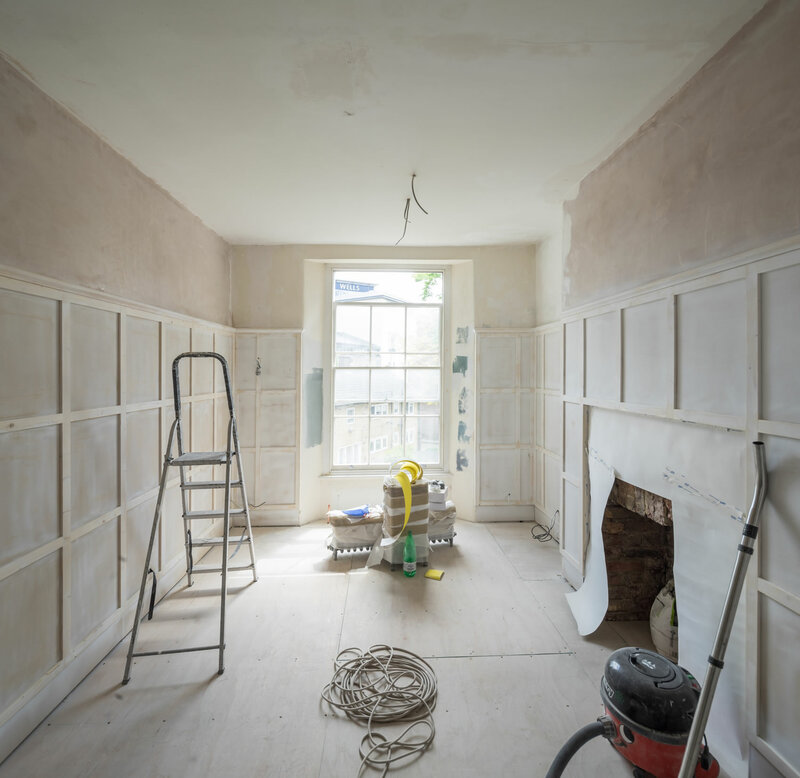 We introduced new wall panelling into the living space to refocus the room back to the fireplace and define it as its own space, with its own identify. Continuing in this inventive and creative vein, we sourced a pressed-steel bathroom sink that was originally manufactured for a German garage. 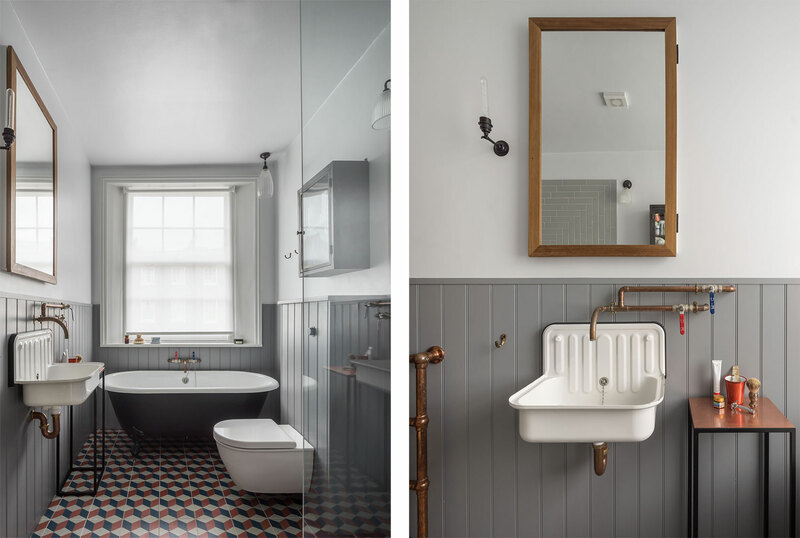 Blending old and new, we retained as many Georgian details as possible but complimented them with contemporary design elements such as our custom made geometric bathroom tiles, reclaimed iroko timber and copper fittings.